This year’s college graduation season comes against a backdrop of rising concern over the costs of higher education, the burdens of student debt and the challenges graduates face in a difficult job market. The issue of costs and rising student debt have have touched off a national debate about the cost and value of a college education. Surveys by the Pew Research Center present a portrait of the views of the general public and college graduates. 94% of parents expect their child to go to college. 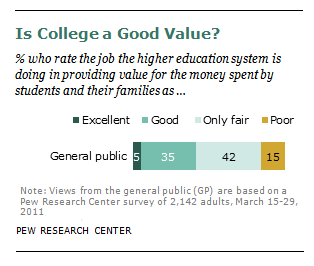 57% of Americans say colleges fail to provide students with good value for money spent. 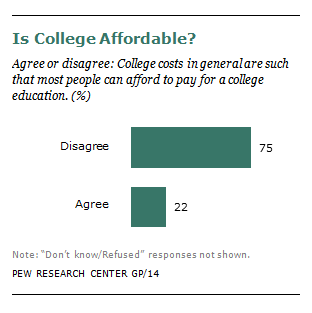 75% of public says college too expensive for most Americans to afford. More than nine-in-ten parents (94%) who have at least one child under 18 say they expect their child to attend college. But even as college enrollments have reached record levels, most young adults in this country still do not attend a four-year college. The main barrier is financial. Concern about the cost of college, while widespread throughout the population, is felt more acutely by some groups than others. Adults ages 50 and older are more likely than those under age 50 to question the affordability of college. Among those ages 50 and older, more than eight-in-ten disagree with the notion that most people are able to afford to pay for college. This compares with roughly seven-in-ten among those under age 50. Men ages 50 and older (many of whom may be in the midst of paying for their children’s college education) are especially concerned about college costs: 83% doubt that most people can afford to pay for college. Women, who have made substantial gains in educational attainment in recent decades, have a more favorable view of the higher education system overall than do men. This gender gap is based solely on differences between men and women under the age of 50. Among women in that age cohort, nearly half (46%) say the higher education system is doing an excellent or good job providing value for the money spent. This compares with only 36% of men under age 50. 86% of college graduates say their schooling has been a good investment. 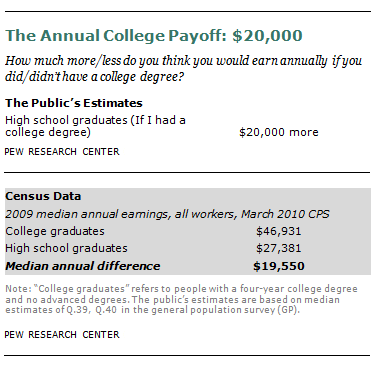 Adults with a college degree believe they earn $20,000 a year more because of it. 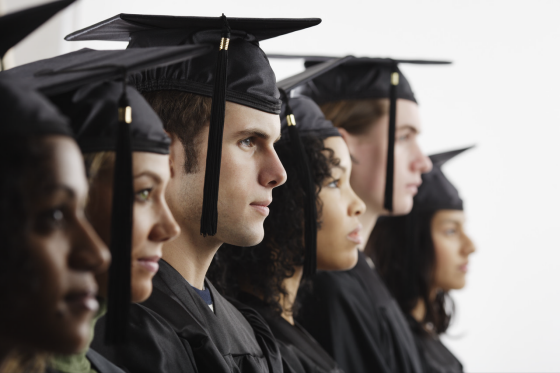 A typical college graduate earns an estimated $650,000 over a work life than a high school graduate. When asked whether college has been a good investment for them personally, considering how much they or their family paid for it, fully 86% of college graduates say it has been a good investment. Only 6% say college has not been a good investment for them, and 7% say they are not sure. Likewise, those who are currently enrolled in college express a strong belief that they are making a worthwhile investment. Among current college students, 84% think college will be a good investment, considering what they or their families are paying for it. Some 14% say they are not sure if it will be a good investment, and only 2% think it will not be a good investment. Adults with a college degree estimated, on average, that they earn $20,000 a year more by virtue of having gotten that degree. Likewise, the survey finds, adults with only a high school diploma believe, on average, they earn $20,000 a year less as a result. This average figure masks wide variations in the financial returns to a college education, such as field of study — work-life earnings tend to be much higher for undergraduate majors requiring numerical competencies (computers and engineering) than fields such as education and liberal arts. 48% of students who took out college loans and are no longer in school say repaying the debt has made it harder to make ends meet. 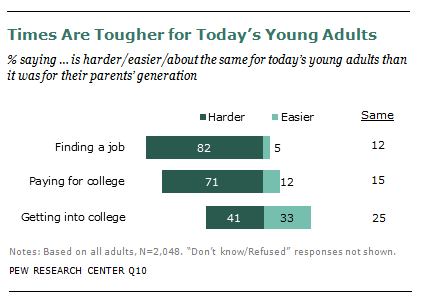 71% of adults say it’s harder for today’s young people to pay for college than it was for their parents’ generation. 82% of all adults say it’s harder for young people to find a job than it was for their parents’ generation. 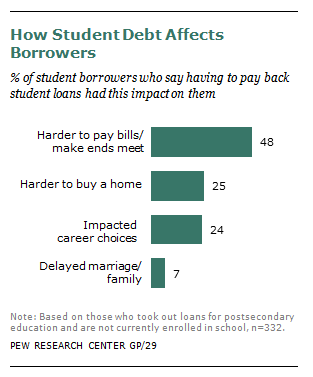 Among respondents in the March 2011 Pew Research Center survey who say they took out college loans and are no longer in school, about half (48%) report that paying back the loan has made it harder to make ends meet; 25% say it has made it harder to buy a home; 24% say it has had an impact on the kind of career they are pursuing; and 7% say it has delayed their getting married or starting a family. Among adults of all ages, 82% say it’s harder for today’s young adults to find a job than it was for their parents’ generation. Only 5% say it’s easier now to find a job, and 12% say finding a job is about the same as it was a generation ago.